Along with being a homeowner comes many responsibilities. You should want to keep your house in the best shape possible. This will increase its resale value but it will also allow you to enjoy your home while you are living there, without worrying about the headaches caused by repair work. 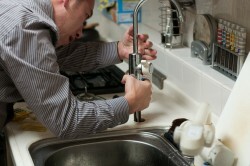 Plumbing is just one of the systems you need to maintain. Repairs can be costly and disruptive which is why it’s in your best interest to invest in preventative maintenance to keep your plumbing infrastructure working properly. Faucet and pipe leaks: A small leak might not seem like a big deal, but it can create one! It can eventually cause water damage and it’s also a waste of water and money (think of your water bill!). It’s also important to inspect your pipes, which you likely don’t look at on a daily basis. Look for signs of a leak, like puddles or water stains and keep an eye out for corrosion, which can cause leaks. Slow drains: Don’t just dump chemicals down the drain. To properly maintain the pipes it’s important to clear the debris that collected. Running toilets: Find that you need to jiggle the handle after each flush? It might be a quick and easy temporary fix but it’s still running water, which can increase costs and potentially cause bigger problems down the road. You’ll also want to always be on the lookout for water on the floor around the toilet. Maintain your septic system/sewer main: A blockage is a serious problem. If you have a septic system, it’s important to regularly have the tank inspected and cleaned out. If you have a sewer, it should be snaked. These are just your basic, standard checks. If you notice something is wrong but don’t trust yourself to fix it, leave it to the professionals! Many plumbers also offer preventative maintenance programs, if you aren’t quite sure what to be looking for or you don’t have the time to check these items regularly yourself. Maintenance services typically occur annually or bi-annually depending on how old the system is or if you have any special needs that require extra attention. Speak to the plumber to see if you can tailor the program to fit your needs. If you hire a plumbing company to conduct preventative maintenance, be sure to understand what the terms are, if there are any guarantees for work performed and how long the guarantees last. Yes, it requires time and money to conduct preventative plumbing maintenance but it is much less than the costs associated with unplanned repairs! Think about how much you rely on your plumbing, if it isn’t working properly, even for a day, it causes huge (and potentially unnecessary!) headaches.